Rubber and Plastic Seals/Extrusion Profiles The use of rubber seal: Rubber seal is widely used in various kinds of industry, including auto parts, doors, window, machine and construction industry. Rubber seal could work during -40 centigrade to 160 centigrade. The function of rubber seal: Rubber seal could stop air, water and dust enter the machine system, which could protect the machine or parts to be healthy and working well. The advantage of rubber seal: The flexibility and anti-aging capability of EPDM rubber seal is very good. 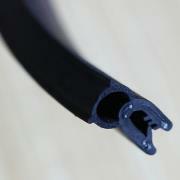 Rubber seal is more flexible than PVC seal.